The origin of the game of blackjack is hotly debated. To this day, historians aren’t sure exactly where the game came from. However, there are several likely culprits. 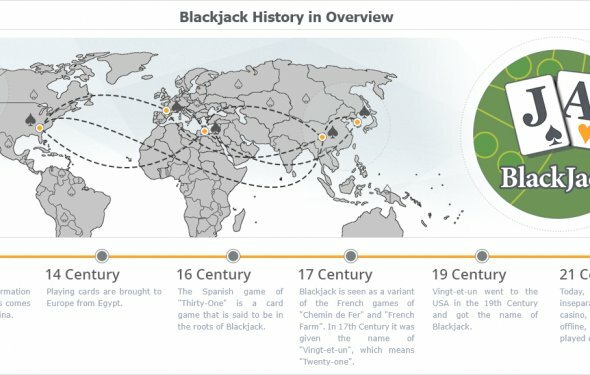 Similar games throughout history had been played in different areas of the globe, and all of these are likely to have influenced each other and led to the creation of the game of blackjack as we know it today. The first time that the game of “twenty-one” was referenced in literature was in the early 1600s in a book written by Miguel de Cervantes, author of Don Quixote, called Ronconete y Cortadillo, about gambling cheaters in Seville. The book mentions a game called “Veintiuna”, which is Spanish for twenty-one. The game, according to Cervantes, is played without tens like present-day Spanish 21, and Aces are worth either 1 point or 11 points. A similar game is known to have been popular in France. “Vingt-et-Un”, which is French for twenty-one, originated in French casinos in the early 1700s. In Spain, a similar game known as “One and Thirty” was in vogue. In this game, the objective was to reach a total of 31 using three or more cards. There is also one school of thought that suggests a game similar to present day blackjack was being played as early as the Roman Empire. The Romans were great fans of gambling, and many believe that they played a game like twenty-one using wooden blocks with numbers on them. Although, there are no concrete evidence to support this to date. The game of twenty-one spread throughout the North American continent. However, it wasn’t especially popular as North American gamblers found it to be boring and didn’t think the payouts were worthwhile. Therefore, Nevada casinos began offering a special bet to draw more players in 1931. This bet offered a 10 to 1 payout for any player that achieved a 21-point hand made up of a Black Jack and the Ace of Spades. Although the 10 to 1 payout is no longer given (in most modern-day casinos, blackjack pays 3:2), the name stuck and the game is known as Blackjack to this day. What are the colors of gambling chips? Here are the values and colors of each chip that you would find in a professional poker game:White-$1,Yellow-$2, Red-$5, Blue-$10, Grey-$20, Green-$25, Orange-$50, Black-$100,Pink-$250, Purple-$500, Burgundy-$1000, Light Blue-$2000, Brown-$5000. I hope you write this down somewhere for future reference.